Ever have one of *those* days where you just aren’t on your game? Usually we try to keep those days to ourselves and hope no one is noticing, but I’ll share a couple of pieces of one of my brain dead days in hopes that someone gets a good chuckle, that someone learns something, and that *I* never, ever, make this particular mistake again. So there were two tasks remaining to complete my voice gateway setup: configure local conferencing and configure a single MGCP port on the router – in this case on a 2800 series. Let me just preface this by saying this same setup had been done for approximately 20 other sites. Imagine my surprise when neither the conference bridge nor the MGCP port registered. This blog entry will focus on the conferencing issue and mayhem that ensues when you just can’t see what it is you’ve done wrong. If you find yourself in a similar situation, there are several things you should check right out of the gate. Or should that be gateway? But I digress. Is sccp running on the router? Enter no sccp, then sccp to confirm. Is the dspfarm profile active? Enter dspfarm profile 1 conference, then do a no shut. Is the name of the conference resource correct on the router and in CUCM? In our example above it’s my-Conf, that *exact* name should be entered in CUCM. No wiggle room in this one – copy and paste it from the router to be sure. Is the conference bridge type you selected correct? 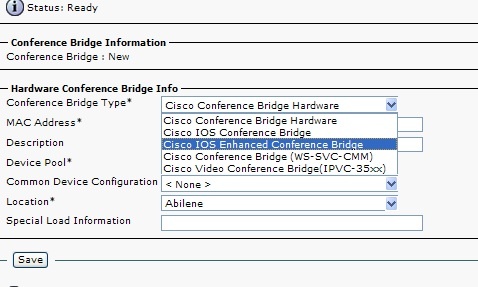 When I added the bridge to CUCM, I selected Cisco IOS Conference Bridge. Sounds like a good choice, right? Uh, no. What you really want is Cisco IOS Enhanced Conference Bridge. Which is what had been picked the other 20 times this had been done. But for whatever reason, I picked the former, and let me tell you, the system does not provide a handy error message that says “hey bozo, you picked the wrong bridge type.” Although, I am sure that will make it into the latest release. So just add “Confirm the correct conference bridge type, you ninny” to your checklist when configuring a conference bridge on an IOS router. And try very hard not to overlook this mistake the 90 times you check your configuration afterward. It’ll save you a few hours of head scratching and an embarrassing call to TAC. *In order for your devices to use the fabulous conference bridge you’ve just setup, be sure to assign it to the appropriate Media Resource Group and Media Resource List. Also, be certain you have assigned the MRGL to the devices or device pools that will need it. The resource name in CUCM can only be 15 characters long, keep that in mind when naming your resource in IOS. And what was the story with the MGCP port registration being rejected? Wrong slot/card type? Thanks!! Part 2 – the great MGCP rejection- to come soon, stay tuned! Not to sound like a rookie but why did you want this feature? What does it offer to the end user? by having the conferencing local to the site, the voice traffic doesn’t have to travel across the WAN to be processed by conferencing resources, so less latency. Very good for sites connected by lower bandwidth links. If you’ve ever used TAPS (or just BAT for that matter), then the DatabaseConfigurationError makes sense. 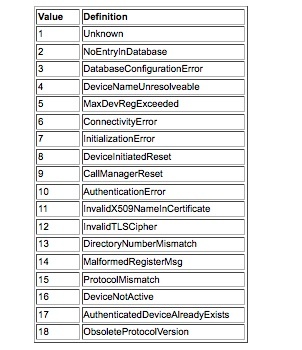 When you BAT in a phone with the wrong model type, you get the same error. Your post took me through all the checks. Amy, I think I love you. Kidding. Your posts are great.